Mizuma Art Gallery is pleased to present new work by Satoru Aoyama. Aoyoma is known for his photo-realistic embroidery. He has in recent years developed his practice to incorporate found objects, such as a Virgin Mary keyring, or a plastic apple and give them the religious iconography look. By doing so he attempted to transform the value of the objects while the audiences are attracted to the beautifully detailed stitches. For “Crowing in the Studio”, Aoyoma exhibits 5 embroideries, a series of 80 drawings and 2 works produced in collaboration with fellow Artist and friend, Jin Kurashige. His new work explores the relationship between the work and the process. 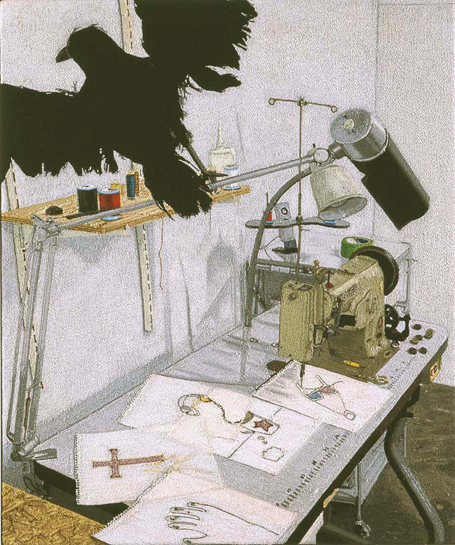 Within the embroideries, the audience can see scenes depicting the Artist`s studio and clues to how the work was made. Aoyoma’s pieces are made through time-consuming process by his old sewing machine brought over from England, which he often describes as one of “the earliest technology produced by the Industrial Revolution”. The development of technology has altered our lives and has bought great comfort and speed, yet can also distance us from our natural creative impulses and sensibilities. By exposing his studio space and work processes, the Artist seems to explore and question the realm between technology and tradition in art and society. The two collaborative pieces can be found in the small exhibition space. The first piece is a lightbox containing 12 layers of drawings on tracing paper, which creates a “still animation”. 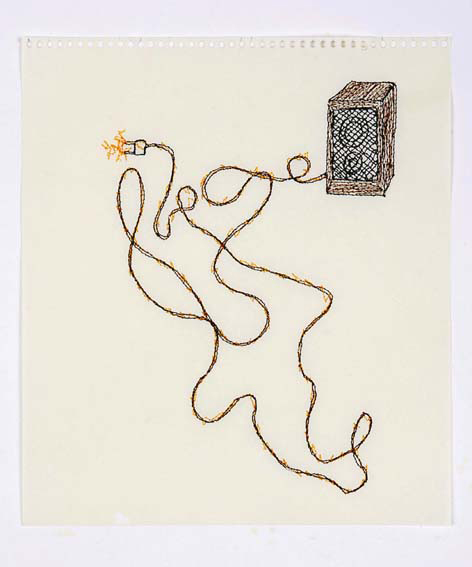 The second piece is an animation of a sewing machine endlessly stitches a red line. Its sound can be heard throughout the space and acts as a soundtrack, integrating all the elements into one installation. Satoru Aoyama was born in Tokyo in 1973, and studied at Goldsmiths College, London and the School of the Art Institute of Chicago, Chicago. He has recently held solo exhibitions in The Chicago Cultural Center, Michigan Avenue Gallery, Chicago (2007), One in the Other, London (2007) and has exhibited in group shows, including “Alllooksame? ARTCHINAJAPANKOREAART” (curated by Fransesco Bonami), Fondazione Sandretto Re Rebaudengo, Turin (2006), and Souvenir Mine (curated by Satoru Aoyama), Mizuma Art Gallery, Tokyo (2006).